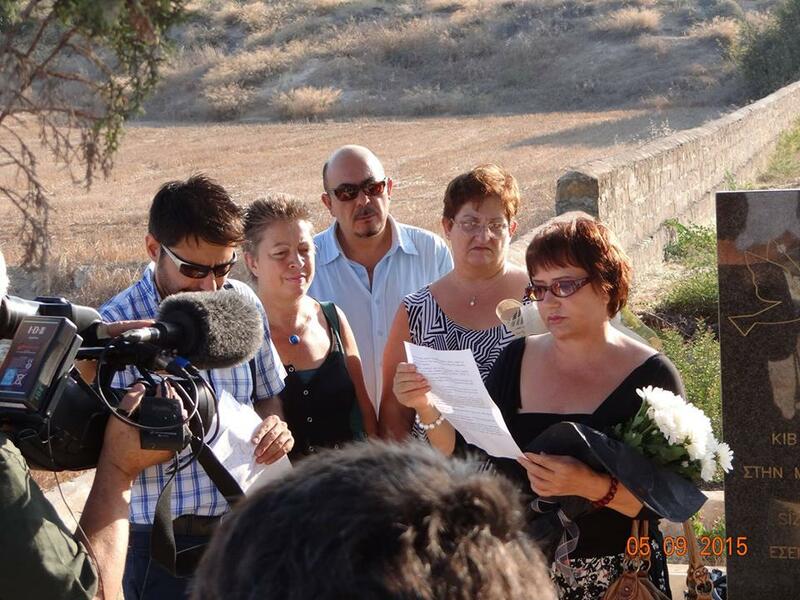 Leyla wanted to build a monument-grave in memory not only of her husband Ahmet Mustafa but in memory of all Turkish Cypriot and Greek Cypriot `missing` persons in Mari. Why Mari? Because this is where Leyla is from and before 1974 Turkish Cypriots of Zygi did not have a cemetery of their own and used to bury their deceased in the Turkish Cypriot cemetery in Mari. “Thank you everyone for coming here today… I wanted to build a symbolic monument-grave in memory of all missing persons of the Cyprus tragedy with the income I got from the sales of my first book entitled `The White and Wet Handkerchief That We Shared…` I am peaceful that I have achieved that and thank everyone who supported me in this aim. I want to thank everyone who is working for the finding of our missing persons, to the Cyprus Missing Persons’ Committee and to my dear friend journalist Sevgul Uludag. Not only those `missing` persons but their relatives also suffer living in a whirlwind of deep trauma. And they pull their families in this trauma. I had got married a second time. But just like me, both my husband and my son lived through this trauma for many years… This trauma lasts long years and is passed from one generation to the next. I lived through dilemmas inside myself… Despite the fact that I lived through this tragedy, the only result I deducted from this is that we owe bringing peace to this country in order to stop such pain from being lived again in the future. We can’t forget what we have lived through but we can forgive those responsible… After struggling within myself for many years, I forgave those responsible for my tragedy and I called on them to question their consciences. We did not lose only our loved ones after 1974. We also lost our homes, our land, our country. With pressure they built the illusion of `our side` and `their side` and wanted us to forget our houses, our towns and our villages. How can one forget the house that a grandfather had built with his own labour, how can one forget his or her past or his or her memories? Dear friends, I am very emotional today… But I am happy that I see you here. You give me pride and strength. I ask all of you, particularly from my new villagers in Mari to protect this monument-grave. He was among a group of Turkish Cypriot men from Zygi, Tochni and Mari, who fell victims to acts of hatred and terrible revenge, by Greek Cypriot men in August 1974. Today 41 years on, Turkish Cypriots and Greek Cypriots, together, are paying an overdue tribute, not only to Ahmet, but also, to those who died, Greek Cypriots and Turkish Cypriots. Today it’s an occasion, to reflect on the turbulent years of our past, which led to the loss of innocent lives, causing deep pain and divisions amongst both of our communities.